The Village Association is planning a range of resident get-togethers, to enable villagers, whether young or old, established or newly arrived to meet and interact with each other. The first event is to be held at the Mark Cross Inn where Roger has organised a 2 course buffet at a special price, so all can attend. The Village Association want to encourage everyone to get to know each other in the village, in these days when it is so easy to lead an isolated and separate life. The Village Association want to foster a community atmosphere and help us work together to keep the village a great place to live. Come along and meet the neighbours, enjoy a meal and a drink, in a friendly atmosphere! 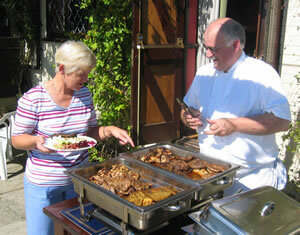 The Village Association organised this get together at the Mark Cross Inn on Saturday 4th September 2004. We were made very welcome by the staff, and Roger put on a great spread of different marinated and barbequed meats with a supporting table of different salads. This was followed by desserts of cheesecakes and chocolate éclair rings. 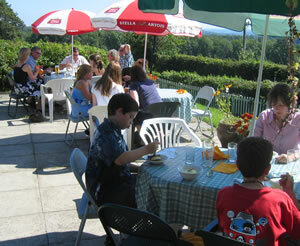 Most people sat out on the terrace enjoying the views and a wonderful sunny day. Whilst we had approximately 30 adults of all ages plus children, it would be great to see more villagers attending the next get together probably around November 5th.